Huddersfield Town welcomes Everton in a game from the 24th round of the Premier League. Allow us to take a look at this fixture in our vip soccer bets. Currently Huddersfield Town are the weakest team in the Premier League. They are 20th in the standings with just 11 points won so far and their hopes of survival are getting more and more smaller. Huddersfield have won just 2 games since the start of the season and they are currently on 10 points behind the 17th Newcastle United and the safe zone. In their last five matches Huddersfield Town have won just one point – during the 0-0 draw with Cardiff City away from home. In their last match Mark Hudson’s boys suffered a 0-3 defeat against the champion Manchester City. But nobody really expected something different from this match. Everton on the other hand are 11th in the league with 30 points. The Toffees have a record of 8 wins, 6 draws and 9 losses since the beginning of the season. More or less, Everton’s performance this season is a little bit dissapointing. Last summer the club signed some really good players to the team, but so far the manager Marco Silva is struggling to make the team perform in consistent way. In their last five games Everton won twice, but also suffered three defeats. Which is a perfect example for the team’s inconsistency. It’s under a question now if the club is going to keep the manager Marco Silva for another season. In their last game Everton suffered a defeat, being beaten with 1-2 during the visit to Southampton. 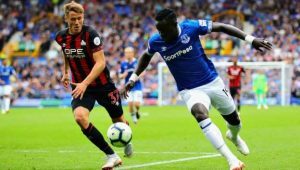 James Ward-Prowse and an own goal from Lucas Digne gave Southampton a good lead, while Gylfi Sigurdsson’s goal for Everton was not enough for a point. That’s our vip soccer bets for the Premier League clash between Huddersfield Town and Everton.